The Central Vermont Regional Planning Commission (CVRPC) is poised to help breathe new life into contaminated properties with a $400,000 award from the U.S. Environmental Protection Agency. When environmental investigation concerns or costs deter a redevelopment project, CVRPC can provide funding to research the issues, test for hazardous substances, and design a cleanup plan. CVRPC is currently accepting applications for funding on a rolling basis. Both public and private improvement and redevelopment projects are eligible. The CVRPC Brownfields Program has supported redevelopment of City Place, Ayer’s Autobody and The ReStore in Barre City, as well as The Center for Arts & Learning and Turntable Park in Montpelier. Along with the Vermont Brownfields Liability Limitation Program, these environmental assessments are important tools in managing environmental risk. CVRPC is available to assist municipal officials, as well as private property and business owners with navigating contamination concerns. Please contact Gail Aloisio at 802-229-0389 or aloisio@cvregion.com. Further informational materials are attached. The Central Vermont Regional Planning Commission (CVRPC) is excited to be partnering with VT Dept. 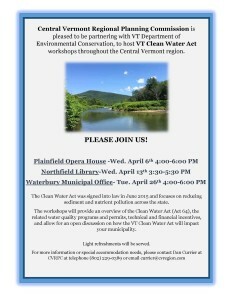 of Environmental Conservation to host three VT Clean Water Act workshops throughout the Central Vermont region. The VT Clean Water Act (Act 64) was signed into law in June 2015 and focuses on reducing sediment and nutrient pollution across the state. The workshops will provide an overview of the Clean Water Act (Act 64), the related water quality programs and permits, technical and financial incentives, and allow for an open discussion on how the VT Clean Water Act will impact your municipality. Join us in May to make Vermont stronger, together. Vermonters continue to face climate-related challenges like powerful storms and warming temperatures, all while navigating shifting economies and new policies. We must act now to protect our treasured people and places. 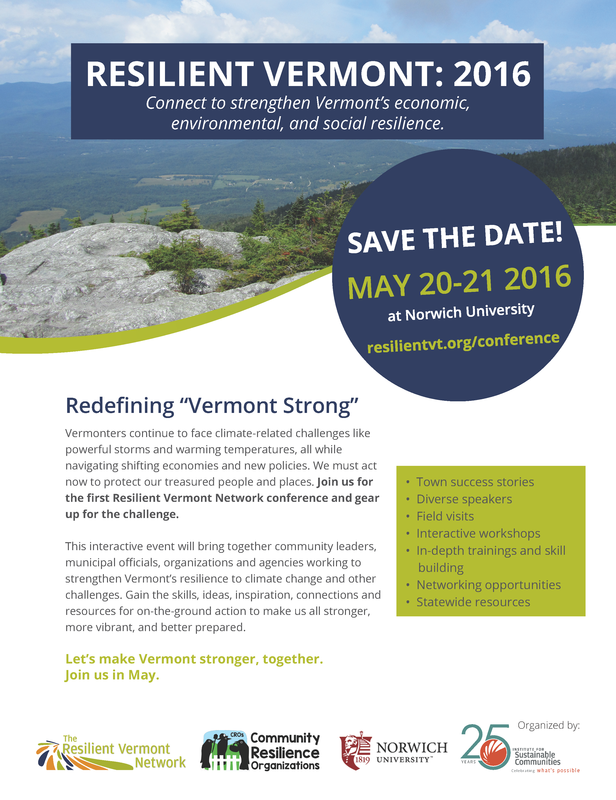 Join us for the first Resilient Vermont Network conference and gear up for the challenge. This interactive event will bring together community leaders, municipal officials, organizations and agencies working to strengthen Vermont’s resilience to climate change and other challenges. Gain the skills, ideas, inspiration, connections and resources for on-the ground action to make us all stronger, more vibrant, and better prepared. Please join us for this exciting gathering of conservation commissions within the Winooski basin. Learn what Conservation Commissions have done across the region! See the list of Conservation Stories from across the Winooski Basin below or add a new conservation success story. Figure out who is doing what, where. We’ll be doing an organizational mapping activity to figure out what commissions and conservation NGOs are doing work in each town and across the region. Discuss next steps. What help does your CC need? How can we better help you? What collaborative projects can be achieved in partnership across the region or even among a couple neighboring towns? • increased consumer demand for Vermont-made wood products. The committee unveiled a new tool to help both industry members and consumers connect. The Vermont Forest and Wood Products Online Directory is an interactive map of many of the wood and forest related businesses and resources in the state. The tool can be utilized for a variety of purposes, including to find a nearby forester or a kiln that dries a particular type of wood. The map is linked to the Working Lands website as well as that of the Department of Forests, Parks & Recreation. The report and directory were unveiled at the Southern Vermont Forest Meetup, hosted by the WLEB Forestry Committee. The meetup was held at the Marlboro School of Graduate and Professional Studies in Brattleboro and was followed by a tour of Cersosimo Lumber, the largest sawmill in the state. Over 60 industry members and partners were in attendance.The event built on the success of last June’s Forestry Summit, held at Sugarbush Resort, and focused on building connections within the sector.